COSAFA | Angola book semifinal spot at COSAFA Under-17 Championships! COSAFA Men's Under-17 / Angola book semifinal spot at COSAFA Under-17 Championships! Angola book semifinal spot at COSAFA Under-17 Championships! 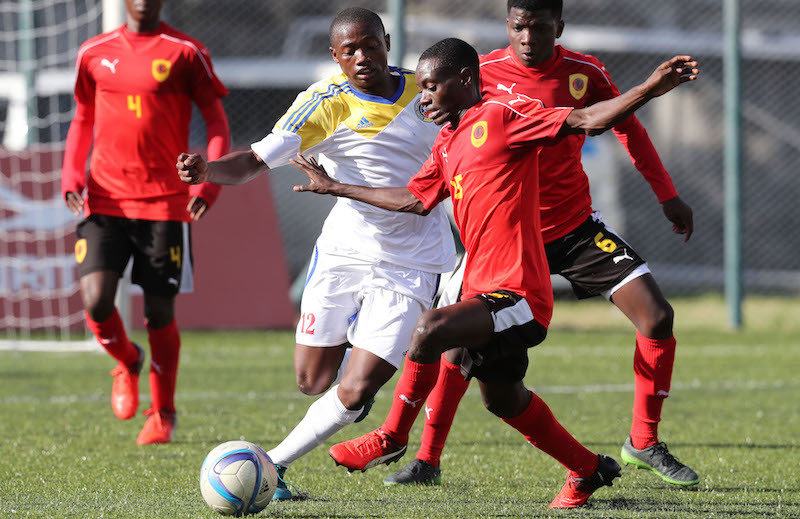 Angola became the first team to secure a semifinal place at the 2018 COSAFA Under-17 Championships in Mauritius on Monday as they completed a thumping Group C victory over Swaziland. Angola ensured they would finish top of the pool with a 4-0 success over the Swazis as Zito Luvumbo grabbing a brace of goals. The side also hit the back of the net through Domingos Andrade and Jose Cabingano as they moved into pole position in the pool with a full haul of six points from their opening two games. Angola cannot be overhauled at the top as the only sides who could finish level with them on points are one of Malawi or Swaziland, who meet in their final group match, but as Angola have already beaten both, they would be top on head-to-head standings. Earlier, Malawi sent Zimbabwe packing from the tournament with a 5-0 victory that underlined their quality. Zimbabwe, so dominant in COSAFA football in the past, continued their battles at Under-17 level as their two losses in 2018 means they cannot qualify for the semifinals. Patrick Mwaungulu scored twice and there were also goals for Tatenda Mbalaka, Francis Mtoso and Emmanuel Mitole as Malawi romped to victory. The Malawians, who finished third in their last two visits to the tournament, could yet finish as the best runner-up and book a semifinal place with a big win over Swaziland, who are also not yet out of contention. Groups A and B will come to a conclusion on Tuesday when the final round of matches are played concurrently. Group A leaders Botswana will need just a draw against Namibia at the Stade Anjalay (12h00 local; 08h00 GMT) to book their place in the semifinals, but they could also qualify as the best second-placed team even with a defeat. As the final standings are decided on the head-to-head basis, a win for Namibia would see them leap-frog Botswana into first place. But if Mauritius beat Seychelles at the Stade St Francois Xavier in a fixture that kicks-off at the same time, that result, coupled with a Namibia win, would see all three sides finish on six points. That would create a mini-league involving only matches played between those three sides to decide the winner. Seychelles have already been ousted from the competition but will be playing for pride. Group B comes to a head when South Africa and Zambia clash at the Stade St Francois Xavier (15h00 local, 11h00 GMT). A draw will be enough to see South Africa finish above the defending champions and take top spot in the pool, at the same time likely ousting Zambia from the competition unless their five points would be good enough for the best runner-up spot. At the same time Lesotho and Mozambique clash, but will be playing for pride.